On our new page, we usually like to give you a detailed insight into how our gig work – how brides and grooms decide to hire us, how we liaise with the venue, which timings work best, song requests and how the evening went. 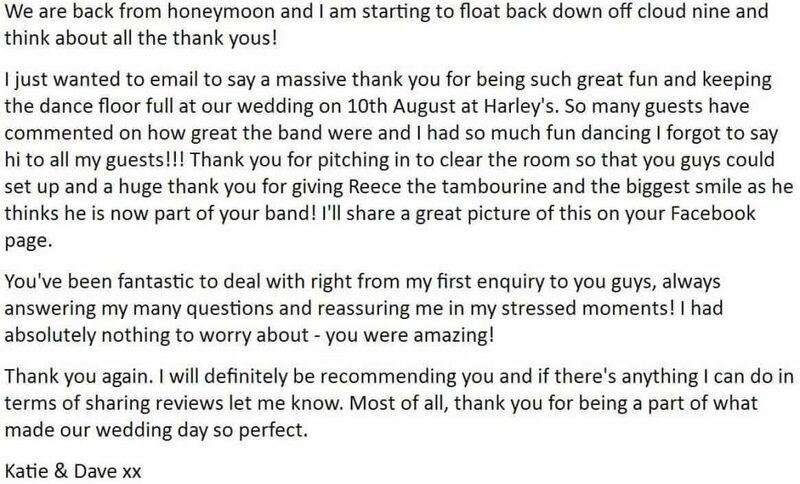 On this occasion however, we thought a screenshot of a post-gig email we received from Katie the bride from a recent wedding reception we played in Kinver, Worcestershire, would suffice. So, if you’d like more information on Hard to Handle band, please contact us direct on 0796 433 5657. We look forward to hearing from you!